CoolSculpting is a new technology developed by Zeltiq® that gently and effectively reduces unwanted fat by up to 25%. As a non-surgical fat reduction, CoolSculpting® has revolutionized the way Doctors are able to taret and eliminate pockets of fat that have been resistant to diet and exercise. CoolSculpting is also the only technology cleared by the FDA for non-surgical fat reduction with controlled cooling. CoolSculpting works by delivering precisly targeted low temperatures to fat cells beneath the skin. The fat cells freeze, become crystallized and die. The precisely controlled method of cooling is called Cryolipolysis® and was developed by scientists and physicians at Harvard. A benefit of the Cryolipolysis® method is that it does not cause damage to other tissues. After you and your doctor determine the area to be treated, you can sit back and relax while the CoolSculpting device is positioned on your body to apply targeted cooling to unwanted fat cells. To start, a pinchable bulge of fat will be packed into a hollow rectangular handpiece, or applicator, where the fat cells are frozen. Initially, you will feel some pressure and intense cold, but these sensations dissipate. You may feel pulling, tugging, pinching, or numbness during the procedure from the temperature, but the procedure is not painful. There will be no damage to your skin, as only the fat cells are targeted, using Cryolipolysis®. When the treated area is released from the suction device (which is a little like a handheld vacuum attachment) you will have a small block of frozen tissue, which we will then massage until it returns to a normal shape and distribution. Most people are very comfortable while the CoolSculpting by Zeltiq® device is used by the Doctor to gently contour (coolsculpt) the body, while safely freezing away fat. How Long is the CoolSculpting Procedure? The Coolsculpting procedure takes between one and three hours in the office, depending on the area of the body being targted. After treatment most patients experience a noticeable but natural looking reduction of fat in the treated areas. 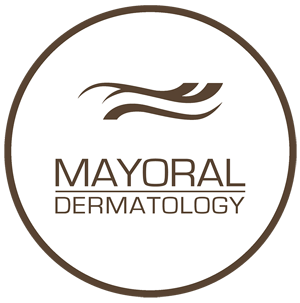 Patients may decide to undergo more than one treatment, which is a decision the Doctors at Mayoral Dermatology can help make while considering needs, goals, and budget. What Results can I Expect from Coolsculpting? You can expect a 20% to 25% reduction in fat after one treatment. Best results will be evident after the destroyed fat cells are eliminated naturally by the body. Immediately after the procedure, you won’t see a change, as your body must first naturally process the crystalized fat cells. As the treated cells are eliminated the troublesome pockets of fat are sculpted away. Results become evident in about 3 weeks, with maximal results at two to three months. Fat resorption and elimination continue up to six months after the procedure. Coolsculpting Before & After Photo Gallery. Click here. You can return to normal activities immediately following a treatment, since CoolSculpting is not a surgical procedure. After the procedure, you may have redness, tingling, or numbing. You may experience some minor bruising. There is no damage to your skin, and no need for pain medication or sedation. Because CoolSculpting is a painless and non-invasive procedure that achieves results nearly equivalent to liposuction, there is no anesthesia required. You will not need pain medication or sedation, which will allow you to return to your normal activity after your CoolSculpting treatment. Is CoolSculpting a Weight Loss Program? CoolSculpting is not a weight loss program for the obese, but it is an excellent program to jumpstart body sculpting in troublesome areas, before, during, or after a program of diet and exercise. Weight loss results in shrinkage of fat cells, but the number of cells remains constant, and they grow when we gain weight. With CoolSculpting, the number of fat cells is reduced by targeted destruction, and the fat cells are gone for good. Your clothes will fit better, you will look better, and you’ll feel better, whether or not you lose weight during the procedure. Maintaining a healthy diet and exercise program after your treatment will ensure your results are long-lasting. Although you will have a reduction in fat cells in the area that has been treated, you can still gain weight that will accumulate in areas that have not been treated with CoolSculpting. Weight gain will result in enlargement of your remaining fat cells. CoolSculpting destroys targeted fat cells, and your body will subsequently process and eliminate the fat. After these fat cells are destroyed, they are permanently gone. If you gain weight after your procedure, you will gain it evenly, and not just in the areas that were treated. Many people are so encouraged by the results of their CoolSculpting procedure that they are motivated to eat well and exercise, taking better care of themselves. What area may be CoolSculpted? CoolSculpting is a good procedure for stubborn fatty tissue that is resistant to exercise and diet, and can be used on the abdomen and thighs. New attachments allow the procedure to reduce smaller areas fatty tissue on the upper arms, the knees, and inner and outer thigh areas, places that are difficult to shape. Many people like to target fat in the lower belly and the love handles. CoolSculpting is a great procedure for people who are near their ideal weight and want to sculpt specific body regions. It is not a useful procedure for the obese, unlike gastric bypass surgery, but it’s a wonderful non-surgical and noninvasive option for areas that would respond to liposuction. Your doctor can help you determine if you are a good candidate for CoolSculpting. We are happy to offer several new applicators that match the contour of various body parts to provide better results for patients who want to reduce target problem areas like the inner and outer thigh or vertical areas on the flanks. The development of custom applicators allow us to readily treat petite patients who have small bulges that are bothersome to them. The CoolCoreTM is the most commonly used applicator to reduce fat on the abdomen, as it best matches the abdominal contour. For the flanks, or love handles, the CoolCurve+TM is the applicator of choice, with a curved cup design that will allow better placement and fit on curved and narrow areas. The CoolMaxTM applicator is designed to treat 2.5 times more volume that the other vacuum applicators, and our doctors suggest this applicator for large volume reduction or de-bulking large areas of fatty tissue. The CoolFitTM is the applicator suggested for arms, inner thighs, and long, vertical areas of fat on the abdomen and flanks. The CoolSmoothTM applicator has been developed to treat non-pinchable areas of fat. This applicator is useful on the outer thighs. Use of the CoolSmoothTM applicator requires about 2 hours for the procedure. When you decide to have a CoolSculpting procedure, you can be assured that over a million CoolSculpting procedures worldwide to date have proven this procedure to be both safe and effective. CoolSculpting is FDA-approved for the abdomen, thighs, and the love handles, also known as the flank. When you are having the procedure, you may have some minimal discomfort, numbness, pinching sensation, and sensations of deep pulling or tugging. Just after your procedure, you may experience some bruising, temporary numbness, swelling or redness, tingling, stinging, and pain. If you have cryoglobulinemia or paroxysmal cold hemoglobinuria, CoolSculpting is not recommended for you. If you are obese, CoolSculpting is not a recommended treatment modality for obesity. The price of CoolSculpting will vary, depending upon how many areas you have treated, how many sessions you require, and your body-sculpting goal. In consultation with your physician, you can create a customized treatment plan for your budget and your body. CoolSculpting, unlike other miracle cures, is based upon rigorous scientific research performed by two Harvard University physicians, an idea that was derived from literature that noted that dimples formed on the cheeks of some children who ate popsicles. Cryolipolysis® is the science of selectively eliminating fat cells without damaging skin or surrounding tissue, and CoolSculpting is based upon this patented technology. Call today for an appointment to explore your options for targeted fat cell destruction with CoolSculpting. We will work to develop your individual treatment plan, to meet your goals and your budget. The doctors at Mayoral Dermatology have been performing CoolSculpting since March 2008. We were one of twelve practices in the United States to participate in clinical studies during the 2010 FDA approval process for Zeltiq’s unique CoolSculping technology. Contact us with your concerns or to schedule an appointment. We will reply as soon as possible.